The Perks of Being a Wallpaper — Trim Design Co.
After nearly six years in this house, our front entry and stairwell are ready for a makeover this spring (if I can get my act together and nail down all the moving parts). One of the trickiest parts of helping other people design their homes is that my home projects tend to take a back seat. The other hardest part: options. Because we see so many beautiful things day in and day out while sourcing for our clients, it can be incredibly hard to make a decision for ourselves. That’s exactly what’s happening with my current wallpaper situation. But I am 100% committed to putting new paper up. And I want it to be special and eye catching. The entry is the perfect space to have some fun, to be a little daring, to not be too afraid that you might tire of a pattern or color. Because the entry is a pass through. You don’t live in there, eat in there, or sleep in there, so why not add a little “wow” in there? A breath of fresh air? I thought I’d put together this blog post to share some great wallpapers that you may or may not be familiar with. Because I’m a designer, it was quite easy to get samples sent right to my home. Some of the ones here are “to-the-trade” only, so you would need to order them through a designer. But others you can order samples yourself—sometimes for a cost. Be sure to ask. It’s so helpful to have samples “live” in front of you. Even if you are interested in a trade-only product, if you live close enough to visit a local Design Center, it is worth the trip. Some Design Centers are now open to the public (Boston included). You’re free to go in and browse all the beautiful products to your heart’s content. If you want to make a purchase, you do need to work with a designer. But Boston has a set-up where there is a “Designer-On-Call” in the main entry, and you can work with that designer to make purchases. A sampling of wallpaper samples gracing (or cluttering) my entry. You decide! Now, this sampling of samples is far from exhaustive. And, there’s still more I need to get my eyes on in person (namely, Schumacher’s Chiang Mai Dragon in Lacquer…talk about bold and beautiful!). See below. O.k, now for the samples I have on hand. Let’s start with the two large ones you can see in the reflection of the mirror. These are so fun, because the samples you get are BIG!!! I mean, let’s face it, it is soooooo hard to figure out what a pattern is going to look like on an entire wall. You thought deciding on paint color was hard?!? Wallpaper is crazy hard. And if you’re a little afraid of a lot of pattern, then it’s nearly a debilitating process. Enter: Makelike. Makelike is a multi-disciplinary graphic design collective headed by artist/designers Mary Kysar and Topher Sinkinson. They are based out of Portland, Oregon. And they make beautiful, inspired wallpapers. And, there is nothing quite like dealing with a small company, am I right? Makelike was recommended to me in comment on one of our posts on Instagram. When at first I had trouble finding their website, I DM’d the company and got a helpful response right away. Then I ordered a couple of samples. BIG samples. Like 26”x28” samples!!! They’re $10 a piece, but worth every penny. You just get such a sense of the scale and pattern from a large sample this size. They’re website is easy to navigate, and they include large, room-scale photos for each of their papers, so you can even get a clear idea online for how a paper will look. I wish every company could be like this! I included my dining room chair in the photos to give you a better sense of the scale of the patterns. This Zig Zag paper in ochre is so fun! Whenever I love something, but can’t seem to think of where it would work in my own house I say, “Oh, I’ll save it for the lake house.” Never mind that I don’t actually own a lake house, it’s just a fantasy that I’d have one and be able to decorate it in an entirely different way than my own home. And this, this paper would be fantastic in a powder room, paired with a striking black vanity! And how about this one?! Makelike’s Tangle in Blue. 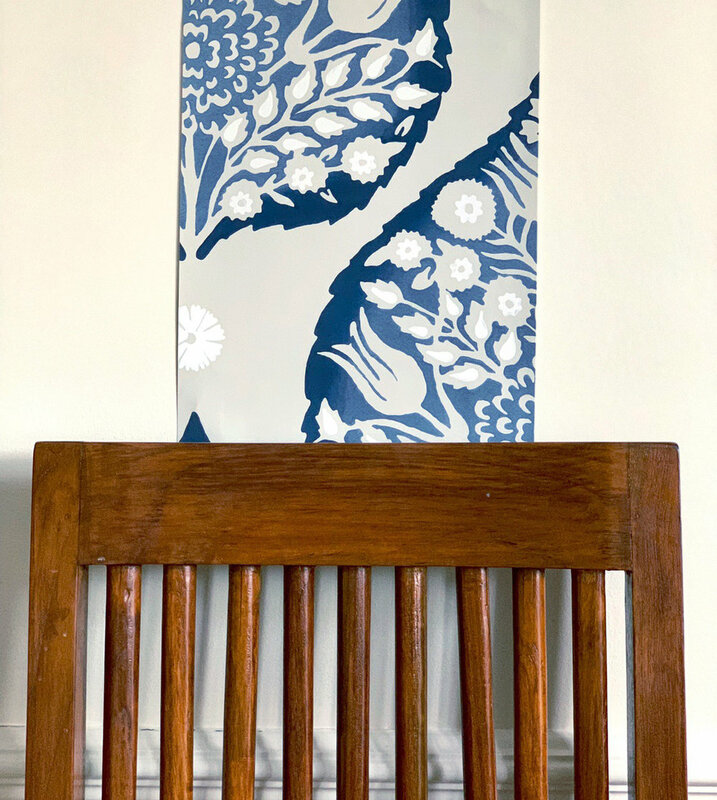 When my daughter first saw this sample, she said, “Wow, that would be a great piece of art in my bedroom!” And that captures it: the wallpaper is art. And you know what, the sample is big enough where I could actually frame it and repurpose it as art in her room. 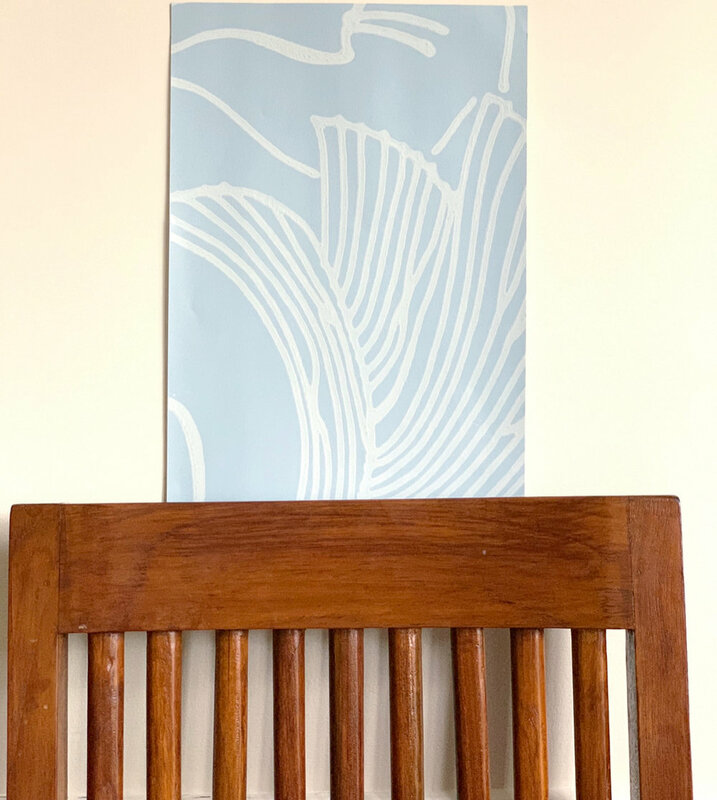 There are beautiful examples out there of people who’ve fallen in love with an extravagantly expensive wallpaper (that usually comes in panels), so to satisfy their passion, they purchase one panel and have it framed. Voila! Art. The venerable paint makers also have gorgeous wallpaper! And you can order up to 5 free samples (8.5”x11”) of different paper. I must be on a lotus kick because I ordered their lotus paper as well. I love how their paper shows the texture of the paint strokes on it—it almost gives it the look (and feel) of stenciling. I really love this lotus pattern. It’s a lot tamer than the look I thought I’d go for in the hall, but there’s something so calming about this colorway, and about the large, bold yet neutral pattern. I also loved how the colors in it are serene, yet warm. It would look stunning paired with sconces in warm brass. I mean, how awesome are these owls? (o.k. so they spooked out my daughters, but I think they’re incredible!). And this Harlequin paper is gorgeous. My only issue is that as a child of the ‘80s, I’m having a little trouble with metallic wallpapers. There are so many lovely ones out there, but I think I’m scarred from what I saw in the ‘80s…This truly is stunning though, and I absolutely love the moody, dark charcoal background. 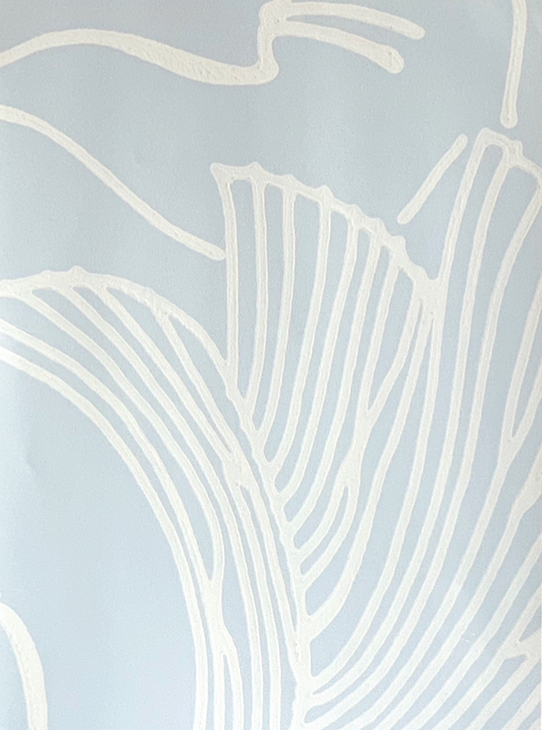 And lastly form Finest Wallpaper, I ordered this Abigail Edwards Seascape sample. I love the Japanese woodblock print by Hokusai, “The Great Wave off Kanagawa” (below), and Abigail Edwards Seascape reminded me of it in kind of a modern re-interpretation. And last, but certainly not least, my favorite Chinoiserie toile-like paper to date! This stunner from Nina Campbell doesn’t come cheap, but I had to get a sample in my hot little hands. It’s so amazing. It’s like having a hand-painted mural on your wall. I especially love how detailed the leaves on the trees are. It’s truly spectacular! Well, there you have it! Some of the wallpapers I’ve been ogling of late. As always, I’d love to hear what you think! Comment below with any favorites, or with other brands you think I should check out in my exhaustive search for the perfect entry wallpaper. I’m all ears!